The medical center provides both primary care (long term, ongoing, chronic) and urgent care (same day) services – all under one roof. Hale Lea Medicine provides the full scope of family practice medicine, treating all forms of chronic and acute illness and injury, including pediatric, adult and senior health care. The clinic also acts as a community access point for other services including Complimentary and Integrative Medicine services, individual and family counseling, physical therapy, therapeutic massage, acupuncture, family planning and reproductive health care, preventive medicine education, screenings for cardiovascular risk, high blood pressure, diabetes, as well as breast, colon, prostate and cervical cancers. Specialists in orthopedics, urology, psychology and/or social work, physical therapy, and physical medicine and rehabilitation come directly to our facility allowing patients to be seen in their own neighborhood if they choose. Hale Lea Medicine continues to develop its department of Complimentary and Integrative Medicine (CIM) incorporating the most advanced evidence based work in this field. Hale Lea, through KCHA, is also dedicated to providing affordable medical care to low income uninsured, and disadvantaged residents of the area it serves. What Exactly Is Urgent Care? Urgent care refers to non-life threatening emergencies that should be attended to right away. Patients may walk in without appointment for urgent care problems These conditions include sprains and strains; lacerations and burns; infections (eye, ear, sinus, skin, genital or urinary tract); migraines; allergic reactions; emotional crises; asthma; sporting injuries; strep throat; fever or flu. Hale Lea Urgent Care is not an emergency room. If you believe that you have an emergency (stroke, heart attack, ruptured appendix etc), you should call 911 or go immediately to the closest hospital emergency department, and not delay definitive treatment. A hospital emergency department treats patients with very serious or life-threatening problems. Hospital emergency departments are not the place to go for common acute illnesses or minor injuries, which are better treated at an urgent care facility such as Hale Lea Urgent Care. We presently serve the towns of Haena, Wainiha, Hanalei, Princeville, Kilauea, Anahola and Kapaa. The clinic presently handles approximately 15,000 patient visits per year. 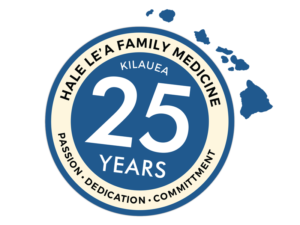 Copyright © 2018 Hale Le'a Family Medicine & Urgent Care. All Rights Reserved.